Thank you to The Pistachio Health Institute for sponsoring this post today! And thank YOU for supporting organizations that align with my values and help make TFD possible! 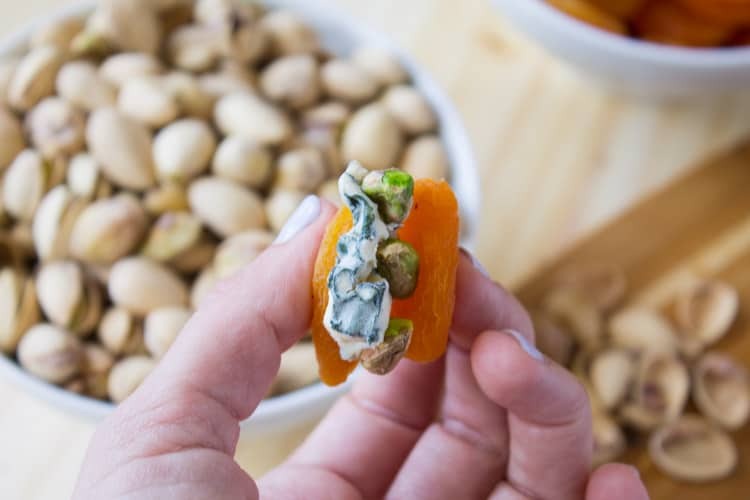 Eat mindfully with in-shell pistachios and this perfect sweet & salty snack pairing with pistachios, blue cheese and apricots. Participants who consumed in-shell pistachios ate 41 percent fewer calories compared to those who consumed shelled pistachios. Those who chose shelled pistachios consumed an average of 211 calories, while those who chose in-shell pistachios consumed an average of 125 calories. 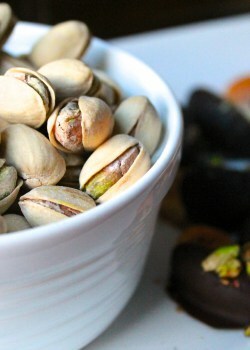 Snackers who left discarded pistachio shells on their desk throughout the day cut their calorie consumption of pistachios by 18 percent compared to those who routinely cleared away their nut shells. From these findings, Dr. Painter concluded that in-shell snacks provide visual cues that may help slow consumption. 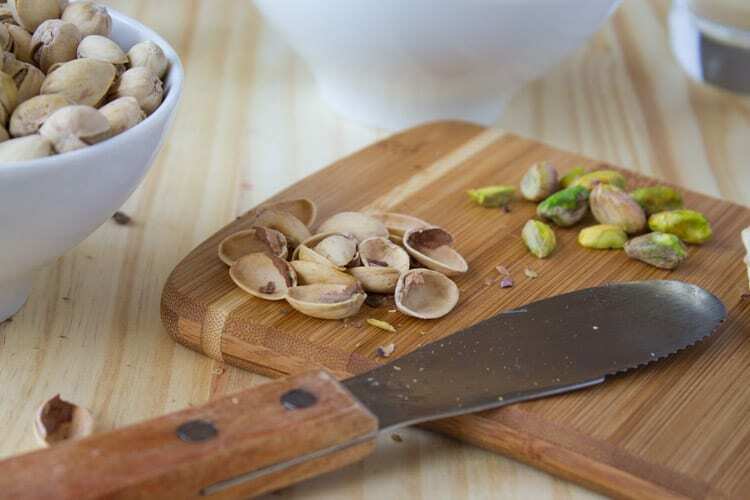 In-shell pistachios may help to slow down eating and reduce calorie intake compared to shelled pistachios because the leftover shells serve as an important visual cue about the amount that has been consumed. You all know I’m a huge believer in mindful eating (hello, mindful eating challenge – remember that?!) so I think these findings by Dr. Painter are fascinating! It all comes down to awareness and mindfulness of how much you’re actually consuming. The shells provide a visual cue for awareness and accountability. It’s the same thing as keeping a food journal or log and writing down everything you consume – it increases your awareness of how much you’re actually consuming and can help you reduce calorie intake as a result. Journaling also keeps you accountable and honest – just like keeping those shells on your desk does. 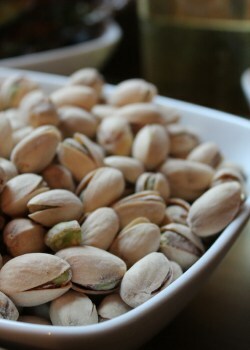 Let’s be real, I could eat pistachios plain any ol’ day. But their salty taste and crunchy texture makes them a versatile nut that can be paired with many different foods, sweet or savory, to create the ultimate snack. 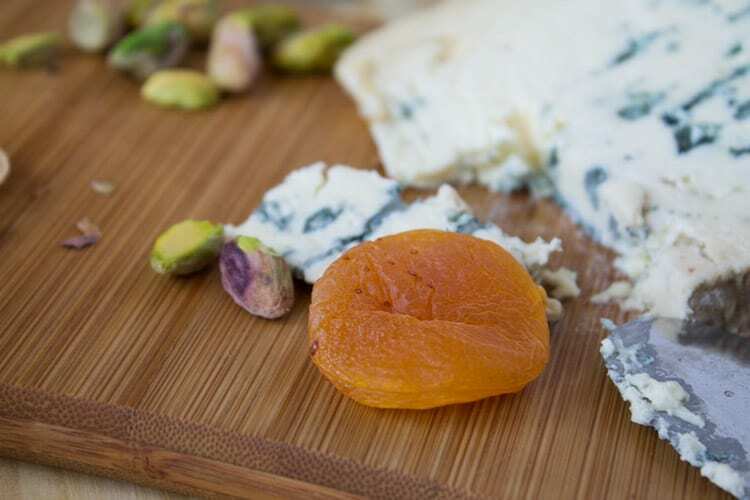 I recently paired in-shell pistachios with blue cheese and Turkish dried apricots. The salty, crunchy nut complemented the creamy texture and sharp taste of the blue cheese and the sweet, chewy apricot. If my taste buds could have a dance party, they’d totally be rocking out after this snack. If you’re jonesing for a sweet, salty and skinny snack that can help you eat less, try this pairing! For more pistachio pairing inspiration, check out my game day pistachio snack and my dark chocolate and mandarin pistachio pairing. Tell me, what visual cues do you use to keep yourself aware and accountable for what you’re eating? What’s your favorite mindful eating tip? I am loving the combination of textures and flavors here! These would also all work well over some greens as a colorful, crisp, and creamy lunch salad. Thanks for this delicious post! I love pistachios- I actually just made a pistachio crusted salmon for dinner a few nights ago. What an interesting combination of ingredients- I can just imagine how flavorful these bites are! 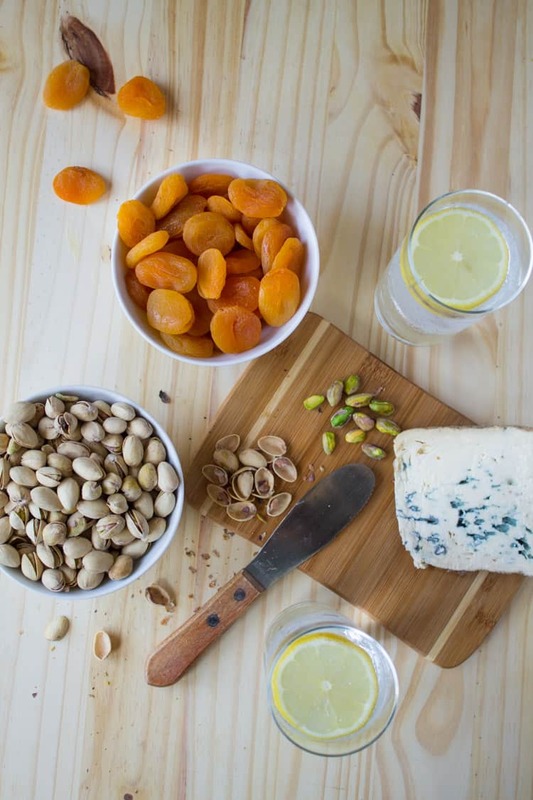 I am so intrigued – I love pistachios and apricots – never thought to combine them with blue cheese for a snack! Such a great idea – thanks for sharing it Kara! Oh, it’s quite the flavorful bite! Sure to satisfy and snack attack. Thanks, Shashi!